​While bullying is not a new social issue, only in recent years has it begun to receive more serious attention. We now know it to be a tremendous problem, leading a wide range of responses from teens, all the way up to suicide or homicide. In Bully Prevention Tips for Teens authors Yvonne Brooks and Stephanie R. Bien present eighteen powerful tips to help teens prepare mentally, emotionally, and physically to stand their ground against bullies. A vast majority of people deal with the struggle of self-esteem issues, self-doubt, and negative thoughts. The key is to acquire the tools to help you cope and get back on track. Brooks and Bien offer teens, teachers, counselors, social workers, mentors, and parents strategies to help them heal and grow in the face of bullying. It seeks to help teens refuse to be victims of negative thoughts, emotions, people, and situations through commitment and character development. This guide provides teenagers and the adults around them with resources and advice to assist them in preventing the issue of bullying. 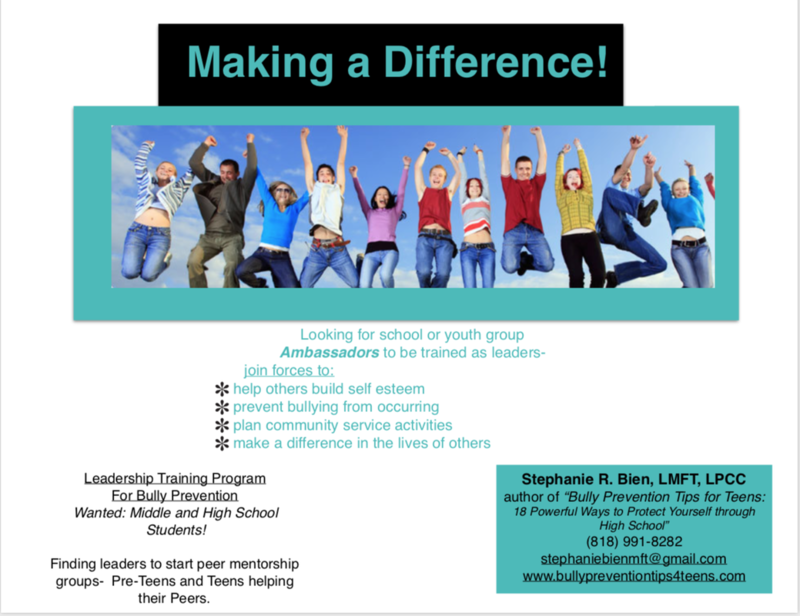 See our website at www.BullyPreventionTips4Teens.com for more information on school and group programs, internships and leadership trainings.